Coronavirus is very common in household cats. Feline infectious peritonitis is a deadly disease in kittens and adult cats, and if one of your pets recently passed away from it, any concern in adopting a newbie may have some validity. When the words "infectious" or "contagious" are involved, it can be difficult not to be slightly wary. Feline infectious peritonitis is the name of a viral disease that results from the presence of feline coronavirus, a prevalent virus that wreaks havoc onto a cat's intestinal cells. If a cat is simply a carrier of feline coronavirus, he may not notice any uncomfortable or painful symptoms at all. Many cats possess the virus without ever experiencing any difficulties or problems. However, in rare and unlucky instances, coronavirus can morph into the frequently deadly condition, FIP. Kittens are especially susceptible to FIP, just like senior cats. 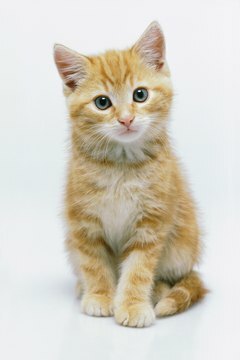 FIP is more problematic for cats who don't have especially strong immune systems -- think the very young and the elderly. The Cornell University College of Veterinary Medicine says the disease occurs mostly in kitties younger than 2 years old, although it can affect all felines. The UC Davis School of Veterinary Medicine reports that in wee kittens, transmission typically occurs roughly around 9 weeks old, although it varies. Despite its moniker, feline infectious peritonitis is not very contagious, according to the Cornell University College of Veterinary Medicine. The condition rarely passes from one cat to another. If you are worried that your late kitty's belongings will transmit the virus to your new kitten, don't be. It is totally safe to get a new kitten at this point. Once coronavirus turns into FIP, it no longer is contagious. Coronavirus itself is contagious, but typically only brings upon very, very minor symptoms such as watery stools, sneezing and runny nose. Thankfully, many cats don't even experience those annoying symptoms. It is extremely rare for coronavirus to turn into FIP. Although a new kitten will not be able to contract FIP from the other kitten that has passed on, it in no way means he has immunity against coronavirus. If you live in a home with multiple cats, this pesky virus is always a possibility. Always keep any and all cats and kittens you have completely safe against danger by thoroughly and frequently cleaning out your litter boxes. After all, the virus is usually transmitted by the accidental ingestion of infected stool -- not good. If you maintain a living environment for your cats that is healthy and isn't cramped, safety isn't an impossible goal -- phew.